Recently we talked about a valuable design concept with Jay Womack, Senior Landscape Architecture and Ecological Designer at Huff and Huff, Inc. Here is the result. Useful Community Development (UCD): Jay, we’re talking with you because you’re taking environmental sustainability to a new level by practicing regenerative design. What is that anyway? Jay: Regenerative design is a design principle in which we look to nature as our guide for everything that we do. We use it as a role model to begin healing the planet by giving back to the earth, very much like nature does. Nature has learned over thousands and thousands of years about what works and what does not. She only takes what she needs so that resources are not depleted. That is the guiding principle of regenerative design. We have to start thinking about how we can give back and not just continually consume. What’s interesting about regenerative design is that it is that next generation of evolution above sustainable design, which has been a fantastic way to get people in general to think more sustainably, but if you think of the base root of sustainable design, it’s to sustain. If all we do is sustain, we’re always going to be taking something, we’re never going to be giving back anything. So that to me is why regenerative design is so important. We have to start to give back to nature and to the earth. Once you understand the message, regenerative design can easily become part of the everyday language of people, designers, schools, and municipalities. It is an opportunity to really rethink how we approach the design process. UCD: It sounds like regenerative design is related to biomimicry. Tell our visitors what biomimicry is. Jay: Biomimicry is a combination of two words, biology and mimic. What we are trying to do is mimic biology, or life, the essence of our world. Take for instance solar panels. They are built on a very simple idea, which is to mimic a leaf’s ability to take in the sun and turn it into energy. That’s biomimicry—to start to find inspiration from nature for life-friendly solutions. Trees can be a role model as well. A tree does a great job of taking in sunlight, creating an invaluable end product, recycling its leaves by putting them back into the soil, and making those nutrients available for other plants and animals. it’s a continual cycle of life that repeats itself every day, month, and year, but never produces a waste product that has to be picked up and taken somewhere else to be dealt with. It’s a very self-fulfilling system. If we translate that to our homes and buildings, imagine how better the environment would be if the places where we worked, lived, and played made their own energy and gave back something to the earth, putting forth a by-product that is good for us, not bad for us. That’s the essence of regenerative design and biomimicry; it’s to mimic nature in everything that we do. UCD: Your background is in landscape architecture. On our website we try not to take it for granted that visitors understand terms that professionals use, so tell us briefly what landscape architecture is. Jay: Landscape architecture requires a professional degree, similar to an architect or a civil engineer. I’ve also taken tests to be recognized as a landscape architect licensed and qualified to practice in certain areas of design. What I really love about landscape architecture is that it encompasses everything that is outside the envelope of a building. We really do think about how people move through a landscape and think about the perception of being in the landscape. We think about the arrangement of items in a park or a plaza or an urban space. We think about how people will use them and interact with the space. And then we bring in landscape, water, and trees to make it a livable place that people enjoy. One of the principles in landscape architecture that most people may recognize is prospect and refuge. People feel safe in an environment that they can see out from, while also having something at their back to make them feel protected. Landscape architecture starts to incorporate the psychology of how people think of a place, why they are comfortable in a place, why they would go there on a regular basis to enjoy the outdoors. UCD: Can you give us an example of regenerative design steps we could take? Jay: A simple example is the incorporation of native landscapes into the places where we live, work, and play. For instance, it might be a prairie landscape. 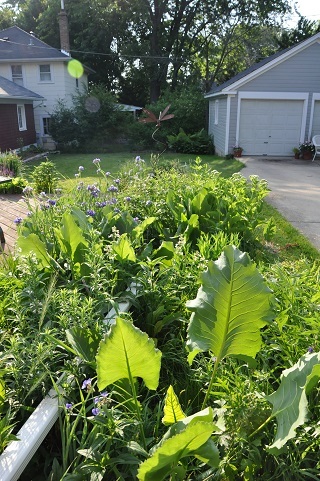 If we look at our default landscape, which is typically turf grass lawn, and ask ourselves how much do we really need, the answer gives us an opportunity to take away a little bit of that turf grass lawn, which is very environmentally insensitive, and replace it with a prairie landscape or other native landscape. UCD: Wait now. You’re criticizing people’s yards. What’s not sustainable about turf grass? Jay: Turf grass is a very unsustainable practice. Turf grass lawn—Kentucky blue grass in particular, which is not from Kentucky, it’s from Europe—is a non-native species that requires a tremendous amount of energy to keep it alive. If you think about every single blade of grass as a solar panel, in April when that solar panel starts to take on energy from the sun, it puts that energy into its root system. Because we are so used to having the turf grass lawn a certain height, when it gets to that height we cut it down to within about an inch of its life, and then all of a sudden when it gets warm, it starts to turn brown. Then we put fertilizer on it and we irrigate it, which makes it happy again and it starts growing. When it gets to be too tall for us, we cut it off with a lawn mower and that starts the whole cycle all over again. What’s interesting about a lawn mower is that it has the exact same engine as your car, except for a carburetor. You can drive your car for an entire week and you will not put as much carbon into the air as you do with just using your lawn mower for one hour on Saturday. They both burn the exact same gasoline, they burn the same oil, but a lawn mower does not have a carburetor that captures the carbon that comes off that engine. Our lawn mowers are very damaging to the environment. UCD: Is there a particular example of regenerative design you would like to talk about? Jay: Yes. I was very fortunate to work with the Mattoon Township Park District in mid-state Illinois, and in particular in Lytle Park. The park celebrated its 100th anniversary a couple of years ago and wanted to re-envision itself for the next 100 years. They really embraced the idea of sustainability and of regenerative design. 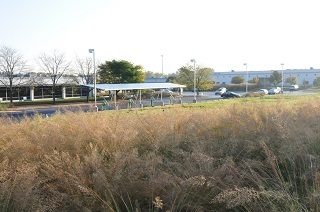 There we helped develop a very large park pavilion with a restroom underneath it. We collect the rain water off of the pavilion roof and store it below ground in a 1700-galloncistern. 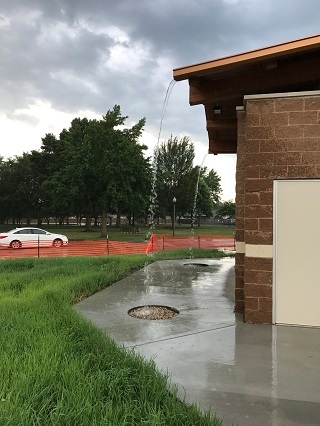 The collected water in turn is used to flush the toilets as a non-potable source for something that we typically use potable water for. It’s a great little cycle of life piece that starts to show people why rain water is such an important attribute of our environment. By capturing and re-using it, we are now reducing our use of potable water, which has to be cleaned to a certain point with chemicals so that we can drink it, and all we are doing is flushing toilets with it. So, it’s a great way to rethink our water use. Another part is starting to restore native landscapes around the park and putting in little signs that talk about why they are important. That in turn has led to beekeeping. The park district superintendent is now bringing bees into the park and teaching kids about beekeeping. Kids can collect the honey and help restore native habitat. Pollinator habitat supports a key component of our lifestyle; bees move pollen around and help create food for us. The whole idea of regenerative design is not just one isolated piece, it’s wholistic thinking about the entire ecosystem, how we heal it, how we educate about it, and how we encourage others to take small lessons home to practice. Each person now will have a little lesson they can take home and share with friends and family. UCD: I would think that some of our readers would look at that and think it is a very expensive way for a park district to do business. Is that your experience? Jay: We were able to get a very large grant because of the amount of sustainability that we incorporated into the park design. The park was going to build a brand new pavilion and restroom regardless since the park was becoming more popular. By thinking in a wholistic and sustainable way, incorporating regenerative design principles, and providing educational moments within the park, they made themselves very attractive to a particular granting agency. A significant amount of money will now be recouped by the park district to do what they were going to do anyway, but also now they have earned back 50% of the money that they had spent, which can now be used for additional items within the park. UCD: So, it is a little bit more of a long-term cost cycle? Jay: Yes, the word cycle is really important here. We look at life cycle analyses and how we can create something that will last longer and provide more benefits for the park. A life cycle analysis is important with every project. It’s understanding the pro’s and con’s of which choice is going to be better for the environment, which one will maybe cost a little bit more but can be offset by reducing maintenance in the long term. That’s where native prairie comes into play. Right now the district is mowing 20 acres of turf grass lawn regularly. As they start to take away turf grass, and the additional costs to keep it alive. the native landscaping will soon pay for itself since it doesn’t require a lot of energy input beyond the first couple of years. 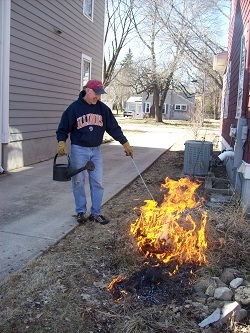 At first the natives will need to have the weeds taken down, but once that ecosystem is healthy and thriving, it’s only once a year or twice a year that you have to make sure it’s being maintained properly. So they are reducing their maintenance dollars. That money can now be spent on things that are more enjoyable for park district visitors. It’s not the most enjoyable thing to be out there while someone is mowing the lawn, but it is pleasant to sit and watch the bees, butterflies, and dragonflies that visit and pollinate the prairie landscape. UCD: How much is regenerative design being practiced? Jay: It is becoming practiced more and more. The East Coast seems to be embracing regenerative design because of a lot of the coastline resiliency strategies that are being undertaken due to the recent hurricanes. They understand how shorelines protect homes and people by starting to reduce some of the storm’s energy. For smaller scale rains, winds, and erosion issues, we can look at restoring our shorelines, restoring our wetlands. These help to absorb water and take the brunt of the first pass of the storm, using nature to help us hold the soils and water. When we look around our cities, we start to see our default landscape either is impermeable surfaces like asphalt or concrete, or turf grass lawn. Those two things are very detrimental to our environment because they don’t do a lot to hold the water, create biodiversity, or create opportunities for healing the earth. We have a long way to go to reset the things we have done. But there are people that are becoming much more knowledgeable on the subject, and one of the things we are recognizing is that it is not just one person or one profession. It’s a combination of many professions. Projects need to incorporate a landscape architect, an architect, an engineer, an ecologist, and an environmental engineer as part of the design team, looking at impacts of design choices and how those choices can embrace nature, bring it into the project, and make it the basis of additional carrying capacity for green infrastructure for stormwater, for wastewater treatment, for renewable energy, recycled materials, and other similar activities. For me a big step toward success is having people involved. Education should be part of the process, by getting kids involved through the schools and various social groups, we can start to teach them about regenerative design at an early age. One day, they will be the Mayors, decision makers, and planners. It is not something that one person will be able to resolve, or even a hundred people. It’s going to take tens of thousands of people, but we can start working at the local level within our neighborhoods to reach those numbers. 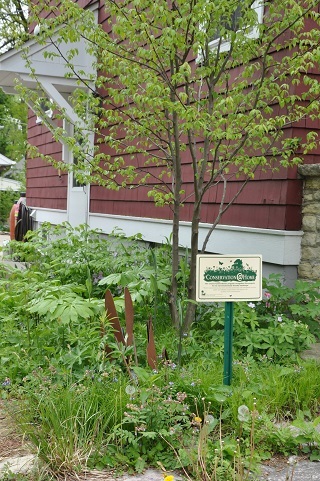 One way of thinking locally would be to create rain gardens at our homes. If we all become responsible for the rain water that comes off our roof and put it back into the ground as a natural resource, we will go a long ways toward a more regenerative tomorrow. This will then help improve our environment and local waterways, creeks, rivers, and wetlands. 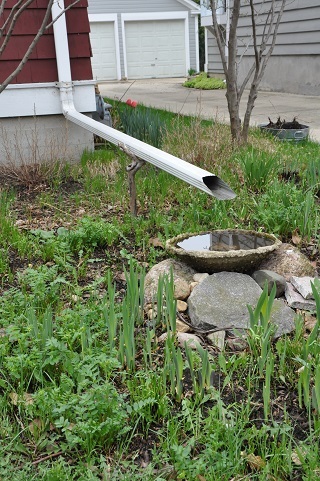 A downspout could end at a bird bath. Because we have disrupted the water cycle with so many impermeable surfaces, most of our small creeks, streams, and wetlands dry up in the summer. This does not bode well for the fish, mussels, salamanders, invertebrates, and all the food chains that bind life together in those waterways. By putting water back into the ground, we can help keep these fragile systems alive so that kids can chase frogs, gather insects, and connect to nature. Think globally, but act locally is such an important line. It sounds hoaky, but it really does come true when people start to think at their neighborhood scale and practice regenerative design.